This year has been particularly exceptional for Logan Instruments. It has seen continued growth by adding new customers to its already expansive outreach across the country and globe. They have attended shows like July’s Controlled Release Society (CRS) annual meeting in Boston, where they connected with some of the leaders in this type of drug delivery. The end of September and beginning of October included three consecutive table-top shows. They attended the annual Transdermal and Intradermal Drug Delivery Systems 2017 in Philadelphia on September 28-29, followed directly by the Sino-American Pharmaceutical Association meeting in Somerset on the 29th and 30th. Finally, on October 2-3, Rutgers University’s Innovations in Dermatological Sciences proved to be another valuable conference for Logan’s team, where two of their team members, Jensen and Sean, learned about new strides that have been made in the field, while also meeting top scientists at the forefront of skin science. As 2017 comes to an end, Logan has again come up with a new way to improve the overall customer experience. The company will be launching and offering a Human Skin Equivalent (HSE) or cultured skin. What does this mean for current and potential customers? 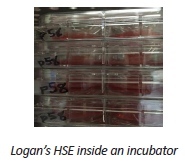 Now, instead of going to another vendor for membrane needs for transdermal and topical testing, you can now procure these products directly from Logan. This product has tested favorably when it comes to histological/visual observations at both the naked eye and microscopic level. 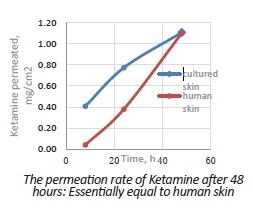 On top of that, when it comes to the permeation rates observed during testing, the results yielded were on par with what one would expect from using human cadaver skin. The added incentive to working with Logan for these products is that the pricing is less expensive than both cadaver skin and competitors in this market. The Logan team will be attending two shows in parallel from November 12-15. Some members will be attending the American Association of Pharmaceutical Scientists (AAPS) Expo in San Diego, while others will go to the Eastern Analytical Symposium in Plainsboro, NJ. These are important shows for Logan in terms of launching the HSE cultured skin product and ramping up for 2018. Look for Logan at these upcoming shows and reach out to them if you are interested in more information or a quote for your lab.